“WOULD YOU PLEASE come down from there?” I fidgeted, absentminded I kicked a small rock on the ground. Alythea always had a mind of her own and there was nobody who could stop her from doing the crazy things she did. It was a God-given gift that she hadn’t died yet, and sometimes I really believed that she never would. Her Phersu was a beautiful creature. Its wings were smooth opaque chimes that released the most musically hypnotic sound making you feel lost in a never-ending dream. It was an impossibly majestic bird, frighteningly enchanting with a daunting prowess—they always said Phersus took after their owners. Alythea was one of the first and only students to have a hatched Phersu. There were rumors of one other student who had one before her, but we had never seen him attend a class in the time we had been there. “Care to join me?” she teased with a wide grin. I rolled my eyes and placed my hands on my hips as I glared up at her. She knew exactly why I refused to join her in the obscenely tall tree in the first place. I was deathly afraid of heights. I preferred to remain grounded; I didn’t trust anything that I couldn’t feel or see. Alythea on the other hand, loved everything about the sky; she reached for it as if she would one day be able to grab hold of it, and the impossibility only kept her from giving up. It was the ephemeral reveries that tickled her mind that had her asking for more, demanding for something beyond ordinary. And, she was anything but ordinary. It was fitting that her Phersu had hatched to be a bird. Sometimes, I wondered how we were such good friends when we were so different. Maybe it was because I secretly wanted to be like her: hopelessly free, uninhibited, and boldly daring. They were qualities that indisputably sparked my curiosity but crept like a haunting trance that threatened to overpower me. I heard the jingle of her Phersu’s feathers. It never got old. The tickle in my ears left a light and pleasurable feeling inside and smoothed my wrinkled frustrations with Alythea away. A soft thud on the bouncy grass blowing in the breeze told me she had finally decided to come down and join me. “One day, I’ll get you to come up the tree with me,” she vowed. Despite their lack of color, her steely eyes had more depth than anyone I had ever known. It played with the lights and reflected any vibrancy it took in. “The world is a whole new place up there.” She admired the endless blue sky. We took a moment to soak in the warm inviting rays of sunlight that escaped through the whimsical thicket of the leaves as it kissed the goosebumps on our skin away. It was amazing that only a decade had past. Celestria was beautiful and at peace once again. It was a time of healing and rejuvenation for Valkryns was on the rise. In Celestria, Valkryns had always been reveled and honored. Greatness was Valkryns. Only when the Night of the Phoenix had devastated Celestria had fear ever been connected with the Valkryn name. Nonetheless, somehow the Founders managed to restore Celestria’s trust in Valkryns and the wish to possess a Ceres was once more, the most desired gift. I guess it was a blessing in disguise, because we were now given the opportunity to receive proper training at Vanderwald. A crack of a twig and the crunching of the earthy ground caught our attention. As usual, against my better judgment, I had followed Alythea here even though I knew we were deeper in the forest than students were instructed to go. Then I saw him. His black hair was brushed to the side as he walked with an assertive and strong gaze locked on us. My heart skipped a beat for the first time and something inside me ignited. The sensation pulsed and a strong pull struggled to break free. His eyes flickered to mine as if he sensed the power struggling inside of me; I was immediately drawn in by his dangerously ash gray eyes soaked with calamity. This was the moment that changed everything. There was no way I could’ve known what was in store for me. Little did I know, I had been born for this single minute; the wheels of fate had begun to turn in the cruelest possible way. The three of us stood in the forest staring at each other for what felt like an eternity; this moment would be forever etched in my memory; and, it was the last thing I saw when I died. It all began the day I met Logan Bray. GIVEAWAY – Enter through Instagram! 2. Like this post & Comment below with 2 friends who might be interested! 3. Share post using #AJLEIGH100giveaway and mention me in the caption! 6. Winners will be contacted and will need to DM me their info to receive their prize!! I’m going to start with the cover. Typically, I hate when covers have human representations of the characters because it robs me of the right to picture the main character the way I read her to look. But, damn, Celaena looks so badass on the cover that I couldn’t imagine it any other way. So, this time I will accept the cover and it is a check from me. The main problem I had with the book was the length. I loved how I was swept into the world of Erilea, however there were times where I dragged my feet and had to force myself to read because things were becoming very repetitive. I was too often too thankful when the author would pass over some of the Tests. Whew. Besides that, I thought the writing was actually quite wonderful. To me, the dialogue is what was the shining star. Each character had a unique way with words and Maas was able to maintain that through every comment they made throughout the book, which made them more believable allowing them to come to life. I found that her visual descriptions were at times a bit confusing and superfluous, and shamefully I may have skimmed those parts one too many times. DORIAN – I have no idea why, but I kept imagining him to be much younger than he was stated to be. The way he spoke and was written into the story, I couldn’t really believe he was 19. His character was probably the least believable for me. I didn’t particularly dislike him as a character, but I couldn’t find myself rallying for him. Overall, I had no idea what to expect when I first started reading the book. And frankly, I found myself surprised when there were mentions of Fae, gnomes, etc. It didn’t bother me, but it did take me for a loop. I gave this book a 4/5 stars because I did enjoy it and found myself engaged while reading it, however a 5/5 book for me is one that I just can’t put down and need to see what happens and then find myself in awe that the author just blew my mind. There were times while I was reading that I assumed what was about to happen next and was basically just waiting for Celaena to hurry up and figure it out. 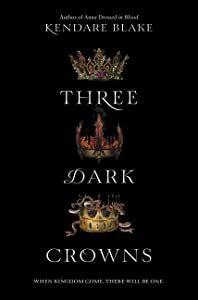 I’ll definitely be picking up the next book in the series, Crown of Midnight, to see what happens next though. (But with Celaena’s four-year-long contract, I hope it doesn’t feel that long…) I might take a break from this series since I don’t have the second book yet and throw myself into a new world. Anyways, I wanted to release the book summary that will be written on the back of the book cover as a thank you for your anticipation and support!